Dr. David Gordon-Thomson graduated MB ChB from the University of Cape Town Medical School in 1983 and completed his internship at King Edward Hospital. After migrating to Australia in 1985, he commenced basic surgical training in Tasmania in 1986. 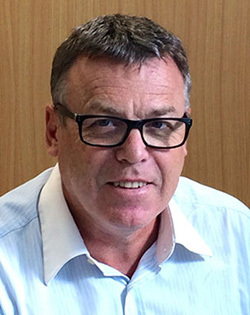 He secured an Advanced Training position in Hobart, and completed surgical training in Melbourne in 1994, obtaining his Fellowship of the Royal Australasian College of Surgeons (FRACS) in 1995. Whilst enjoying 6 years of General Surgical practice on the NSW South Coast, Dr. David Gordon-Thomson developed an interest in Breast Surgery. He conducted BreastScreen Assessment clinics in ACT and participated in the multidisciplinary management of breast cancer patients on the coast. He moved to Sydney in 2001 to pursue his interest and develop new skills in Breast Cancer Surgery. After obtaining a Post Fellowship training position at the Westmead Breast Cancer Institute, he completed his specialist training in 2003. Dr. David Gordon-Thomson was appointed to the Breast Unit at the Royal Hospital for Women (RHW) and Prince of Wales Hospitals (POW) in 2004 and joined a team of highly-skilled clinicians dedicated to the multidisciplinary management of patients with breast disease. A comprehensive service is provided to both public and private patients by surgeons, radiologists, physicians, nurses, oncologists, psychologist, radiographers and sonographers, and lactation consultants. Dr. David Gordon-Thomson has an appointment with Breast Screen Australia where he conducts Breast Health Assessments, Breast Screen Assessment and Results clinics. High Risk clinics are conducted at the NSW Breast Clinic at The Royal Hospital for Women. Private consulting rooms are located in the Prince of Wales Private Hospital. Minor procedures and ultrasound-guided biopsies can be performed in rooms. He operates at The Royal Hospital for Women and Prince of Wales Private Hospital. 2018 BC3 (Breast Cancer Coordinated Care), Washington D.C.
4/6/5 NSW Breast Cancer Nurse's - DCIS, What's New?